In order for the reflection of the sun not to glance off the rebels’ vehicles, and attract the attention of the government’s airplanes, the windows are covered with mud, with only a hole in the windshield for the driver. Jarelnebi notices that you died on the same day as his brother Hassan—December 15, 2006. You were 87 years old, living in Paris. 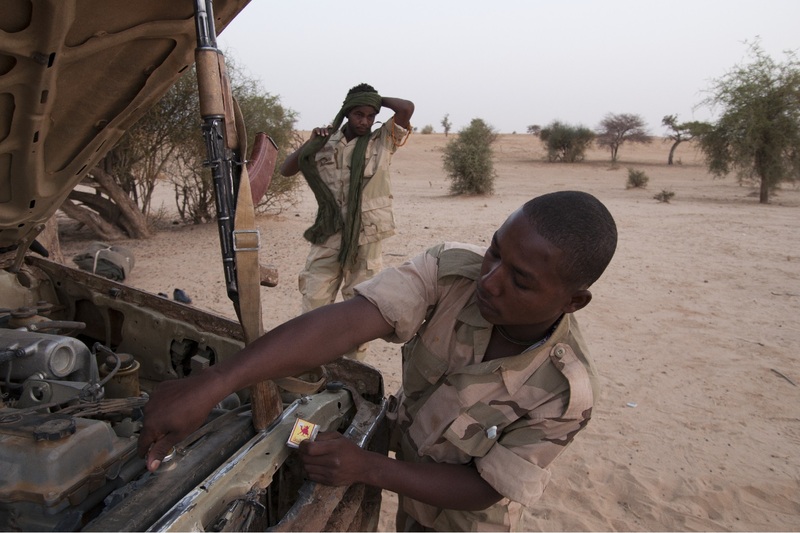 Hassan was 38, killed in a battle at Sayah in the north of Darfur. Before the war Jarelnebi Abdelkarim, a biology teacher, owned a copy of the book that you and my mother wrote about his ethnic group, the Zaghawa. He seems sure that the volume escaped the Janjaweed's pillaging of his house in Kutum back in August 2003. "The Janjaweed spent the night in my house. Everything was destroyed. They took the blankets, the rug, the clothes, broke the television and the cooker. They left the books, which I gathered up and asked my neighbours to look after." 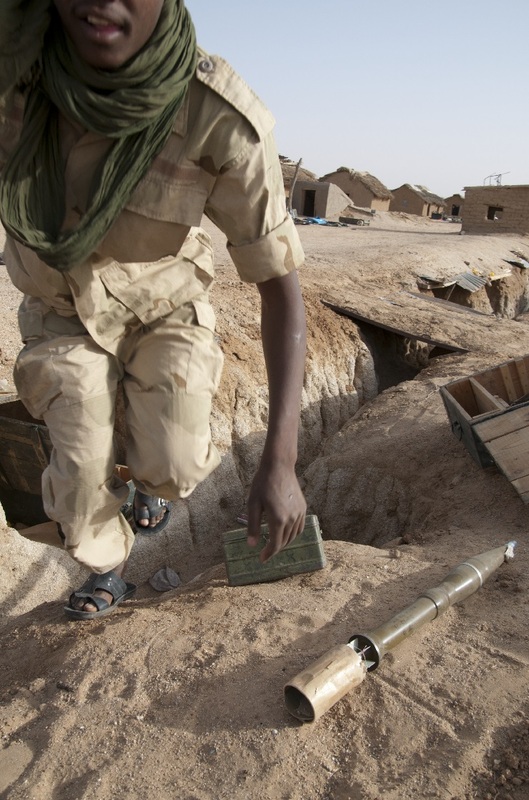 Jarelnebi fled town and joined the Sudan Liberation Army (SLA), at that time Darfur's largest rebel group. His younger brother Hassan, nicknamed 'Peugeot' in memory of the car that he drove while working as a chauffeur in Libya, was already a member. Jarelnebi rose to become a political leader of the movement. Hassan became one of its most famous commanders. We swap news of our families. Jarelnebi is thinking of taking a second wife. "I had only one brother," he explains. "When he died, I suffered a lot. I want to have many boys so that my sons will not suffer as I did. If Hassan were still alive, rebels from the other factions would not have tried to kill me." 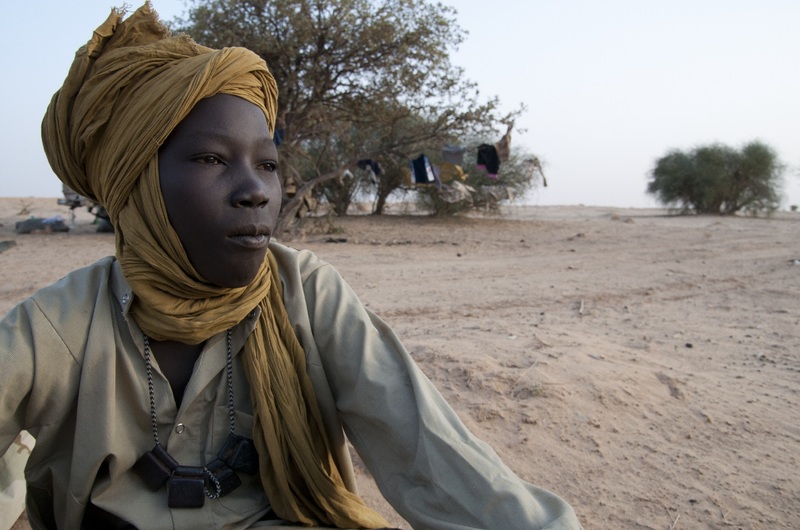 Jarelnebi is the first familiar face I have come across since arriving in Bahay, a village in northeastern Chad, on the border with Sudan, which is marked by Wadi Howar, the only wooded area in this vast desert region. Bahay has changed a great deal since you and I were here fifteen years ago. Back then it was little more than a handful of mud houses. We stayed in one of them, received by Timan Déby, made 'Sultan' by the grace of his brother Idriss Déby, president of Chad since 1990. Today, the Sultan is receiving guests on a carpet made of faux tiger skin. He is now one of the principal supporters of the Darfur rebels, and particularly of the Justice and Equality Movement (JEM), whose leaders, like him, belong to the Zaghawa tribe. With his blessing, the rebels are able to move freely around Bahay and recruit fighters in the refugee camp of Ouré Cassoni. Twenty kilometres north of Bahay, at the edge of the Sahara, battered by sandy winds from which the landscape offers no shelter, Ouré Cassoni hosts 26,000 refugees from Darfur. A few days ago Jarelnebi announced on the radio, without too much enthusiasm, that he was joining the JEM. 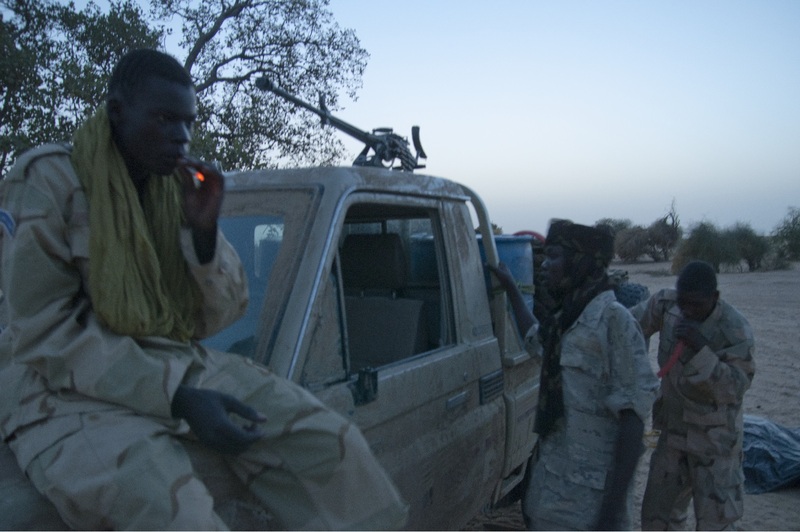 Originally a small group principally formed by a few Zaghawa clans from the Chad-Sudan border, this movement has grown considerably, and in May, 2008 was bold enough to launch a raid on Khartoum from Chadian rear bases such as Bahay, 1,000 kilometres away from the Sudanese capital. Since then other rebel factions have joined forces with the JEM, and its membership is no longer confined to the Zaghawa. The media gives the impression that nothing new is happening in Darfur, and that the war—described by some as a 'genocide' of 'African' tribes by Arab militias known as the Janjaweed—goes on inexorably. Yet the most intense period of violence took place in 2003-2004. Since then, the region has been sinking into a war of all against all: rebels against rebels, Janjaweed against Janjaweed. The Arabs have tired of doing the dirty work of a government that has been slow in fulfilling the golden promises that it made to them, and some of them have even joined the rebellion. The rebel groups are splintered into multiple factions that spend as much time fighting each other as they do fighting the government. Sitting on the sand in front of a shop in Bahay market, Jarelnebi gives me the statistics of the five years of his war: "23 battles—17 against the government and the Janjaweed, and 6 against other rebel factions." Jarelnebi has changed. He shaved his beard off and seems weary of war. This man who previously cared about his land above all else can now picture himself living in a peaceful country, even in Europe, and waiting for the coming of better days. 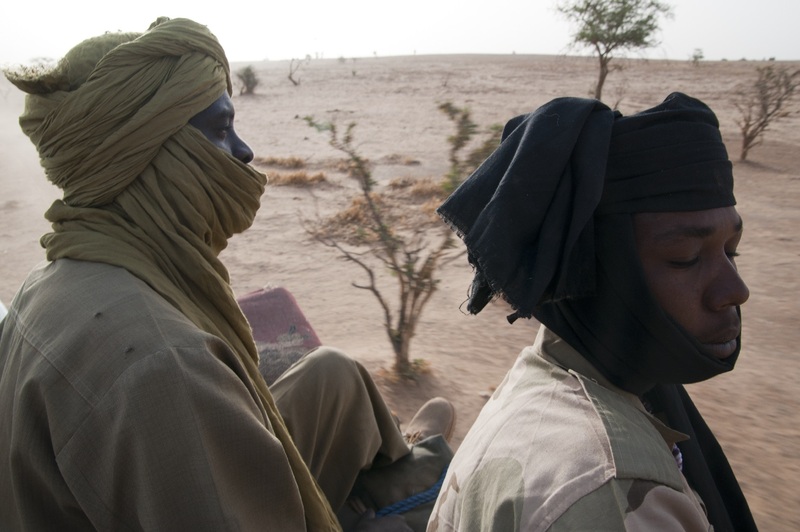 Mahamat Bahareddin and a young Arab from Kordofan sit atop a pick-up in the rebel-held areas of North Darfur. Fifteen years ago, you and I walked through Bahay's market. Lorries from Libya full of goods and passengers—workers coming home with their hard-earned nest eggs—would stop here before continuing their journey toward either the Chadian interior or Sudan. The lorries are still there, but the goods are no longer merely spread out on the sand. Now there are real shops where you can find the same products as fifteen years ago, but in much larger quantities: drums of fuel and cans of soda, both particularly valued by the rebel fighters. The day after my meeting with Jarelnebi I am outside one of these shops, enjoying a Libyan Pepsi in the company of some JEM fighters who are still hungry for the war. 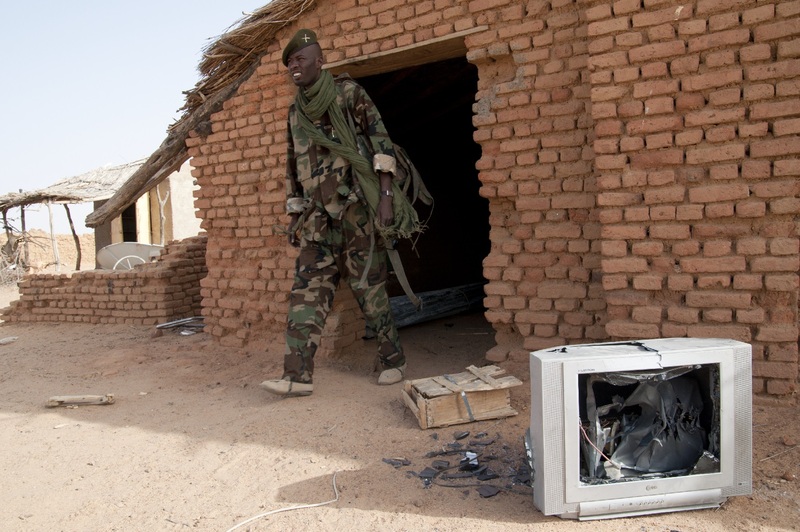 Many of them are new recruits on their way back from Darfur, where they have just scored an important victory, capturing the small government town of Kornoy. After the battle they came over the border, dropped off their wounded at a base, and picked up new recruits in Ouré Cassoni. Amongst these recruits I am surprised to recognise Mahamat Bahareddin, who I first met in late 2006 in Ouré Cassoni camp's Zone B, the sector allocated to the refugees from Am Boru. He is now dressed in khaki, rather than the spotless jellabiya and turban in which I first saw him. A tall, thin man in his forties, Mahamat Bahareddin is a member of one of the oldest and once most powerful Zaghawa royal families—a cousin of melik Ali Mohamedin, the king of Am Boru, with whom you stayed in 1965. Before the war Mahamat Bahareddin was a schoolteacher in Am Boru, and the owner of three lorries that traded goods between Darfur, Khartoum, and Libya. He soon became disillusioned with teaching. "The curriculum only talked about the Nile Valley and Khartoum. I came to realize that Khartoum and Darfur were like two different countries." As a businessman he began to feel aggrieved by the marginalisation of Sudan's peripheries at the hands of the jellaba: the Arabs from the Nile Valley who have monopolized power and wealth since Sudan's independence in 1956. "When Zaghawa like me imported goods from abroad, we had to pay heavy taxes; the jellaba were exempt." In April 2003, the government confiscated one of his trucks. The others he gave to the SLA after joining the movement. He was one of the rebels stationed in Am Boru when the government attacked in January 2004. "The Antonovs dropped more than twenty bombs," he remembers, "and then I heard a big convoy approaching. I hoped it was the SLA but they had army flags. I was hiding. I saw the Janjaweed killing people, decapitating them." 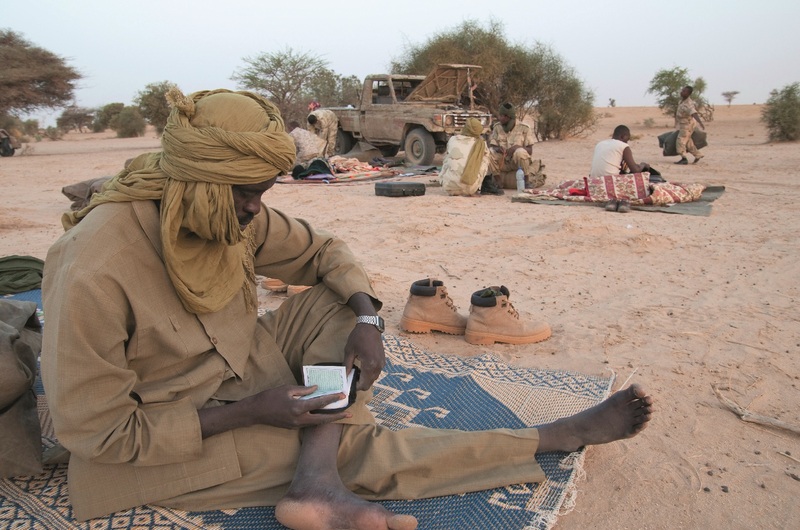 Mahamat Bahareddin managed to flee to Chad, where he became a part-time refugee, part-time rebel. Today he pins his hopes on the rebels managing to liberate Am Boru as they did Kornoy. The next morning I'm sitting on a large metal drum, rattling along on the back of a Toyota pick-up truck. The drum is full of water that tastes of fuel, the rebels' only drink once they have left the Pepsi-filled fridges of Bahay. Around me, sitting on a heap of rugs and bags, are five or six rebel fighters, including Mahamat Bahareddin. Three more are perched on the front of the cab, their legs dangling into the space where the windscreen is normally found; it has been removed to make room for the barrels of the rebels' Kalashnikovs. Ali Wafi, the driver, is looking at the road from between two black leather jackboots. "Hey everybody, you can relax now. We're in our country!" he exclaims while suddenly bringing the vehicle to a halt. My neighbour on the left removes the part of his turban covering his nose and inhales deeply. "Even the air is different here!" he smiles. We have just crossed the bed of white sand that is Wadi Howar—the almost invisible border between Chad and Sudan. As you wrote forty years ago, the Zaghawa "rarely bother with the superfluous formalities of the customs post." Fifteen years ago we walked along the Wadi Howar in Tina, a little to the south of here. For the Zaghawa this border barely exists, but for us it was not possible to cross those few hundred metres of sand that separate Tina-Chad—where the currency was also the Sudanese pound—from Tina-Sudan. The Sudanese regime of Omar al-Bashir was not then, as it is today, simply a junta at the confluence of military and business interests. Back then, under the influence of its leading ideologue Hassan al-Turabi, the regime had religious ambitions, and counted Chad among its targets. Many Darfurians had placed their hopes on a brand of Islamism that promised equality for all Sudanese—or at least for the Muslims of the north of the country. In 1994, Dr. Khalil Ibrahim, today leader of the JEM, was minister of education for North Darfur state. At that time he was involved in recruiting young Zaghawa to go and fight for pro-government militias in southern Sudan. It was only when al-Turabi was expelled from power in 1999 that his supporters in Darfur, such as Dr. Khalil, went into opposition and formed the JEM. In 1994 we were not able to cross this border. You wrote a letter to the Sultan of Tina-Sudan—Dr. Khalil's cousin—whom you knew back in 1965. Writing was the only way to stay in touch with Darfur, even though you knew one shouldn't expect a response. "One does not write much in Africa; a visit is what is hoped for," explained my mother, who, like you, never went back to Darfur after 1970. You were both ethnographers. A strange job: turning up in a village, gaining the trust of the inhabitants, asking and answering questions about one another's strange customs, sharing meals, tea, houses, and even beds. The night you both arrived in Kornoy after your car broke down, shartay Tijani at-Tayeb, chief of the area, got up from his bed covered with embroidered sheets, which also served as a throne during the daytime, and gave it over to my mother. You liked fieldwork. You felt like a fish in water, as you liked to say. Sometimes, I ask myself what I am doing here, plunging for a few weeks into the everyday life of a country at war, knowing perfectly well that I already have my return ticket. I do not believe that you had these doubts. Because you were born in colonial Algeria, you did not see yourself as a Westerner observing foreign bodies. Studying on a scholarship at the colonizer's school made you erudite, but you remained an "indigène," as they said back then, and you were an early partisan of every independence struggle. In Sudan, you felt that you were among your own people. When I got back from my first visit to Darfur in 2004, I struggled to describe to you what I had found. Perhaps I should have written to you instead, as I am doing now. You yourself liked to put important things down on paper. It was as if I was talking about a different place, not the peaceful, welcoming Darfur where you had spent so much time forty years ago. At that time, firearms were a rarity, and the greatest danger was wild animals. You told me that, on a night in 1965, as you walked from your broken-down car toward Kornoy, your Zaghawa companions' biggest fear was of lions. I had trouble believing that antelopes like the kudu were then found close to Bahay. Even more astonishing was that, in the 1930s, Wadi Howar was home to giraffes. Drought has pushed those who have survived it southward—animals and men alike. During your last spell in Darfur in 1970, you remarked upon the effects of a first year without rain. "The land was really ravaged, half abandoned. The Zaghawa left their homes en masse, heading south to where one could still find grass. We found villages almost empty and almost all the trees were dead: it was a real desert." Things were only to get worse. The plain of sand that I am crossing now in Ali Wafi's car, directed by Mahamat Bahareddin, received 200 millimetres of rain a year in the 1960s. Today it receives under 100mm—the benchmark for being considered part of the Sahara. The sun is already burning as Ali parks the car under a thorny tree. We can spot the silhouettes of other JEM vehicles and fighters under some of the bigger trees nearby. We spread out our carpet and lie down in the shade. Some fall asleep immediately, and I start getting to know the others. My travelling companions are not like the rebels that I have met so far: they are almost all Arabs, members of the tribes that provided the government with its militias. Most are under thirty, and they present themselves as alumni of the universities of Khartoum. Sickened by the policies of the government, they joined the rebellion in 2005. From a mountain base, they started to attack government convoys. They quickly ran up against strong resistance, and joined the JEM in 2007. Ali Wafi acted as an intermediary. Thirty years old, lanky, with the air of an American rapper, he has a degree in accounting from the Two Niles University in Khartoum. That is his official biography. Within the JEM, some regard him with suspicion, and claim that he had previously followed Musa Hilal, the most famous leader of the Janjaweed. His defenders retort that he fought courageously in the raid on Khartoum. 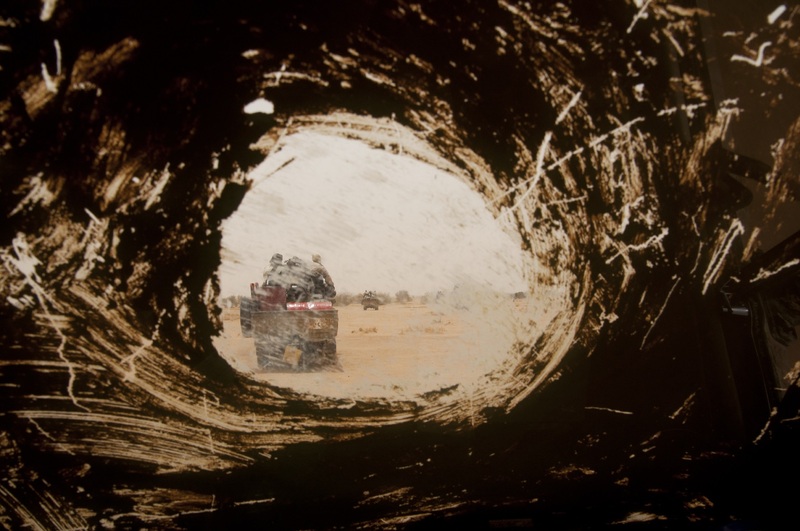 After a tank destroyed his car, he hid in the city, and took three months to slowly get back to Darfur, dodging government checkpoints along the way. He apparently joined the JEM in early 2009, along with forty or so new Arab recruits. Since then, his role has been to persuade the Janjaweed to change sides. Two young Arab recruits take care of our vehicle. 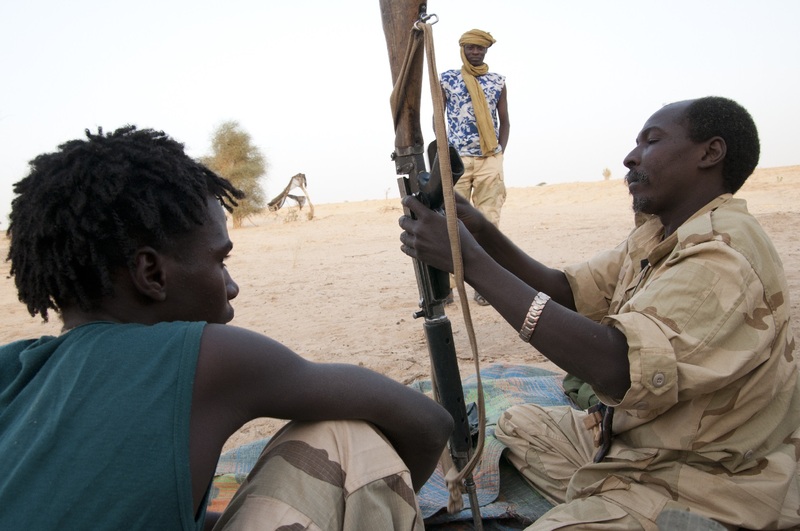 A Zaghawa rebel demonstrates the proper way to maintain a Kalashnikov. In the late afternoon, we share the day's only meal—a dish of burning hot millet polenta. Then, at dusk, the fire is extinguished and the men smoke a final cigarette. From now on, producing the slightest light is out of the question—government planes might spot it. Shortly afterward, we can no longer see anything, and fall asleep. The men don't seem concerned about the Antonov that drones above our heads. The next day at dawn, the same droning wakes me. "Every morning, the Antonov says hello to us; in the evening, it will return to say goodnight!" This is Mahamat Bahareddin, joking. Antonovs are not bombers, just Russian cargo planes. Rudimentary bombs are dropped through the back loading doors. They are so imprecise that the rebels have nicknamed them Haj Waham, "idiots." But this does not keep them from obliging the troops of the JEM to hide under trees during the day and to be in constant motion. Once the white dot of the Antonov has disappeared from the horizon, we jump into the car and leave for Kornoy. The last cigarette before all light must be extinguished. Rebel troops in the ruins of the government’s base at Kornoy. Soon we are speeding across the three successive lines of trenches that were supposed to protect the government garrison. As we pass we are saluted by the barking of the soldiers' dogs that are roaming through the destroyed base. They are the only living beings left here, along with the crows that are eating scraps of food—beans spilling out of a torn-open bag—and a hen that we debate chasing down to improve our diet. Ali Wafi parks amongst the charred brick buildings, amid beds, tables, and chairs that have been reduced to black metal skeletons. The men pace through these ruins, in which some had fought just a few days earlier. The rebels attacked simultaneously from four sides. They entered the base at top speed, firing heavily. There were only three dead in their ranks, and far more casualties among Khartoum's troops, which apparently numbered a thousand men. Dressed in a Sudanese army beret, Ali Wafi inspects the ruins of the base at Kornoy. At the bottom of the trenches, a few government soldiers lie dead among piles of cartridges and packs of cigarettes. The half-open doors of the buried concrete bunkers overflow with abandoned shells and gutted crates of ammunition. The signs of everyday garrison life are scattered everywhere: a television with a broken screen, old newspapers, shoes that someone didn't have time to put on. The rebels I am travelling with make off with humble spoils: a school mathematics textbook, a little plastic mirror, some uniforms. Ali Wafi dons a beret and parodies an army soldier in front of the pole where the Sudanese flag used to hang. At its foot, a plaque pays tribute to the soldiers killed in twenty years of war in Southern Sudan. This monument to the dead inspires Babiker Hamedein, a law graduate and the ideologue of the group, to launch into a speech about the marginalization of all the Sudanese regions, Darfur and the South alike. Suddenly, Ali interrupts him, stretching out a large round stainless steel platter, which is brand new: "Babiker, grab this, we'll serve dinner on it tonight!" Unflappable, Babiker tries to pick up the thread of his speech: "You see, we have even been able to liberate utensils from the Sudanese army." The rebels need sugar for tea. There is none at the nearby market, where the few villagers who have not yet fled purchase precious supplies. But someone gives us another address: an old woman who, scared of the fighting, has taken refuge with her meagre goods under some thorny bushes. Just as we are parking in front of her improvised stall, there are three claps of thunder. The rebels jump from the car and huddle together amid the merchandise, while the old woman curls up in a hole that she has dug in the sand, in anticipation of what just happened; a MiG fighter jet launched three missiles, as signalled by a line of three little clouds still floating together in the sky. The plane is invisible, but it probably caught sight of our vehicle. Scared by the bombing, an old woman takes cover in a hole she had prepared earlier. The old woman is still frightened when the rebels buy sugar from her. She speaks only Zaghawa. Mahamat Bahareddin reassures her, talking with her in their language. She says she remembers that when she was young a couple of khawaja had come for a long stay in Kornoy, with the shartay Tijani. Mahamat turns toward me: "your parents." There is a photo of you walking in front of the shartay's palace. It looks like you are wearing jeans and a turtleneck, a very 1960s outfit. This detail aside, there is something timeless about the picture, with the building's lovely brick arcades in the background. You seem happy. 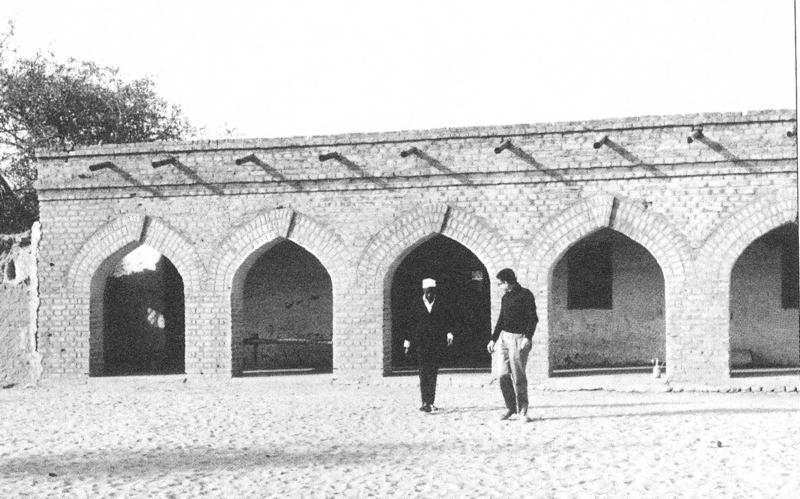 My father, leaving the palace of shartay Tijani, Kornoy, 1969. You were no doubt returning from an audience with the shartay. Years later, you still remembered the raptor-like profile and lordly manners of the sovereign of Kornoy. You dedicated a book to the memory of this "man of considerable intelligence and drive, who was to be a steadfast friend throughout our time in Darfur." All the members of his family that I have met remember these words with pride. Once in El Fasher, the capital of North Darfur, I was invited to lunch by shartay Adam Sabi, the son and successor of shartay Tijani. He had been living in the town since Kornoy had been attacked and occupied by government forces in 2004. "The Janjaweed went into our house and took everything," one of his brothers told me. "Perhaps they even took the knife that your father gave to my father when he was in hospital in Khartoum." He spoke of the Swiss Army knife that you gave to shartay Tijani in 1970, shortly before his death. Thirty-five years later, I was sitting with his sons and grandsons around a large plate of camel meat. To one of them, Amir, I gave a picture of his mother, a gorgeous young lady you met in 1965. She was the shartay's ninth wife and the daughter of an Arab chief. Before the war, intermarriages between the Zaghawa and Arabs were common, particularly amongst chief's families. It was a way of avoiding or resolving conflict. Beside Amir sat an adolescent with light skin, a son that Adam Sabi had with an Arab wife. The tribe that the boy's mother comes from, the Awlad Zeid, is one of those most implicated in the Janjaweed militias that have been attacking the Zaghawa in the Kornoy area. Yet this teenager told me that he often went back to Geneina in West Darfur to visit his Arab uncles. "Your uncles are the biggest Janjaweed!" an old man told him pointedly over lunch. Everyone knew that this old man was from one of the most active clans among the rebels. "And yours are the biggest Torabora," retorted the adolescent. "Torabora" is a nickname for the rebels, a reference to the Afghan mountain range where Bin Laden survived American bombardments. The Darfur insurgents hid in mountains from government planes, and have no doubt picked this phrase up from the media. Zeinab Mugaddem Sabun, the daughter of the chief of the Shattiya Arabs and the ninth wife of shartay Tijani, in 1965. My travelling companions are unhappy to see that today the Arabs of Darfur are systematically called "Janjaweed." This is one of the reasons why they joined the rebellion: "to send a message: not all Arab people are Janjaweed," Omar Karma explains to me. At 26, this former student is fully aware of the camel thefts and murderous conflicts that occurred, even before the current war, between his people and the Zaghawa. It is said that his mother was famous for her war songs, which encouraged the Arab combatants. This did not prevent his sister from marrying a Zaghawa. "She had a son who is here with me in the JEM, so how could I kill my family?" Omar asked me. We are sitting under a skeletal tree, which scarcely offers enough shade to shelter us. But even as he speaks to me in a soft voice, this plump little fair-skinned man, with his uniform that is too new to have seen battle, seems to be speaking to the whole world. "Wallahi [by God], we're against those who say Arabs are the source of all the problems. Not all of us burnt houses and killed people. But some of us are not educated. They don't know anything, so the government made them its militiamen. The government tries to take advantage of the little people." The little people are the nomadic Arabs who have kept clear of schools and development. Because they are constantly travelling through the bush, from the north of Darfur to the south, they seem endlessly elusive. When you were staying in Zaghawa villages in the 1960s, you met them only furtively: "a group of men with camels who apparently come from Chad. We get close and try to strike a conversation. They come from nowhere, they are going nowhere, and live nowhere. No need to insist." The Arabs were almost invisible, unless there was conflict. You wrote "in practice there were almost daily fights over pastures and watering points." The traditional chiefs easily resolved such struggles. Things started to change in the 1980s, when successive regimes in Khartoum, concerned with keeping control over Darfur, began to recruit cronies. A marginal people among marginal peoples, the nomadic Arabs were ideal clients, and the government could appeal to a common Arab identity putatively shared with the elite in Khartoum. "Every time the government approach the Arabs, they tell us: 'We're all Arabs. You, Arab tribes, we're going to help you.'" Omar Karma tells me. "When I joined the JEM, I didn't feel I was seen as an Arab, only as a Darfurian." Is he telling the truth? Of course, under a neighbouring tree, Abdu Mohammed, an Arab teenager, and a young Berti, one of the main non-Arab groups in Darfur, seem like best friends; every day they play cards together, share cigarettes and water pipes, joke with each other, and only part when they have to get into their separate vehicles. A little farther off, however, Mahamat Bahareddin and other Zaghawa seem wary of the Arabs, and often hold conversations in Zaghawa to keep them from understanding. "At the beginning, it was very hard; the non-Arab combatants were really angry to see Arabs in the JEM," one of the founders of the movement explains to me. "It took us a great deal of time to convince them that they had to set aside the past. The issue will be truly resolved when the Arabs and the others fight together." For now, when Mansour Arbab, the JEM's secretary of presidential affairs, sends non-Arab men to bring a message to Ali Wafi, they always have Kalashnikovs on their shoulders. Two friends: one Arab, the other Berti, both fighting for the JEM. Mansour Arbab is the apparent gatekeeper for anyone seeking an audience with the movement's leader and founder, Dr. Khalil Ibrahim. On the third morning of my stay with the rebels Mansour invites me to sit up front with him in the cabin of his pick-up truck, which has been deliberately camouflaged with mud. Even the wing-mirrors have been removed to avoid any reflection that could be picked out by a government Antonov. We set off again to escape aerial surveillance. The sky seems to be completely empty as we join a convoy of around twenty rebel vehicles, followed by an immense trail of dust. In one of these cars, indistinguishable from the others, is the person described by Voice of America as the most wanted man in Sudan, with a bounty of $250,000 on his head: Dr. Khalil. It has taken me four days to get a meeting with the president of the JEM. Is it because he is justifiably cautious? Or is it because he wants to impress upon visitors that he is in charge, just as his uncle the formidable Sultan Daosa of Tina-Sudan used to do? When an arrival was announced, the Sultan had the habit of leaving his village, purely in order to make his visitors wait. In 1965 you had to wait four days for an audience. Sultan Daosa in Tina, 1965. Behind him, his servants carry fans of ostrich feathers. Dr. Khalil (far right), in the area of Forawiya. Sultan Daosa was not an archaic ruler. He sent both boys and girls to school, starting with his own sons and daughters, and he harboured the ambition of opening a university in Tina. But he also had a reputation for being a tyrant. You were told he kept his prisoners in a jail filled with chillies. "I am the government!" he used to declare. His nephew Dr. Khalil has a similar reputation. Born in 1958, a trained doctor and a militant Islamist since his university days, he served as a minister and a government adviser in Darfur and South Sudan during the 1990s. He says that during that time his eyes were opened. "When I became adviser for the government in South Sudan, I found people were not equal. There were long queues of beggars asking for food and money at my door. Later I established an organization to fight poverty. I realized the life expectancy of my people was very short. In the North, in Khartoum, people could reach 70 years or more, while in Darfur they died at 40 and in the South before that. Why should my people have a shorter lifetime? We need a radical solution." Perhaps Dr. Khalil is telling the truth when he says that he is no longer an Islamist, but some traces from those days clearly remain—if not in a religious ideology then perhaps in a certain revolutionary fervour. Dr. Khalil is not lacking 'radical solutions,' as he calls them. This is how he sees the future of the two million people displaced by the conflict. "Will they be going back to straw huts, which one bullet can burn? Already destroyed villages became bush. Our plan is to build villages from stable materials, not wood and grass. We have designed an average family house, with three bedrooms, a living room, a kitchen, a bathroom, and toilets. Each village will have twenty houses, a primary school for both sexes, a clinic, a playground, and a market. Each will have electricity, water, and gas. We calculated that we will need 600,000 houses. We're also asking for paved roads and railways, and we need more than 4,000 jobs. My people are jobless; the government will have to either create jobs or pay unemployment benefit. What you eat, where you sleep, are healed, and learn—all this is the government's responsibility. Now the government is just asking people to pay taxes and join the armed forces. A real government has the obligation to care for its citizens." Utopia? Dr. Khalil seems to be a man from another era, from a 1960s when, in Africa as in Europe, anything seemed possible. If you could land on the moon, why not make water and wheat burst from the Sahara, to say nothing of paved roads and universities? I know little about your dreams back then, but I know that you campaigned for Algerian independence and that, between two spells in Sudan, you joined in the Parisian turmoil of May 1968. 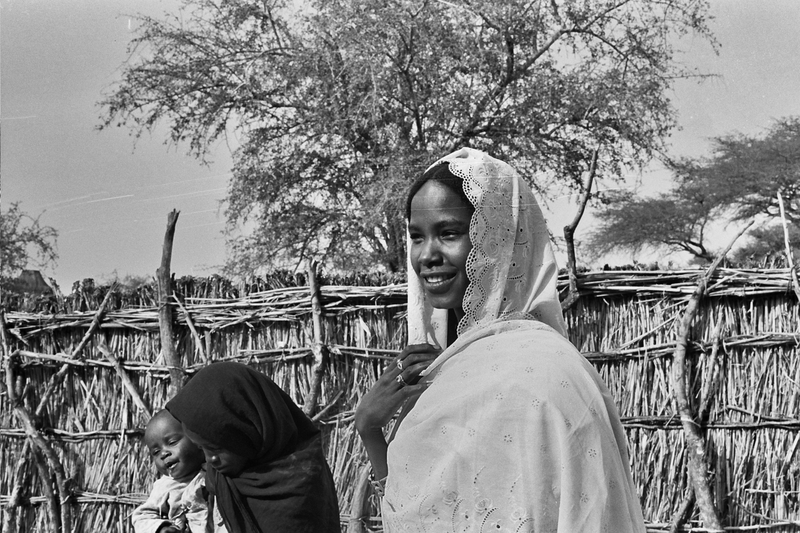 Darfur was a land full of young people, many of whom would never grow old; you would hardly have believed that the population would have leapt from 1.5 million in 1960 to over 6 million today. Elders have transmitted their hopes of a brighter future to the youth, and some of them have taken up arms in pursuit of their dreams. Dr. Khalil is a dreamer. He tells me about the JEM's raid on Khartoum one year ago. "I remember the big desert, the Sahara; it was as if we were navigating at sea. It was really hot; we were in May. There were a lot of airplanes above us, bombing here and there. We wanted to get water in the Wadi al-Melik, but the local Kababish Arabs refused. Some of us thought of taking water by force, but I said no, let's give them money. Later they gave us back the money, offered us two sheep and said, 'You look like good people, go fine to Khartoum!' In Khartoum, lots of people received us, people we didn't know. They were weeping with happiness: 'Welcome, you deserve to govern!' I was convinced people wanted change. People were saying: 'Monkeys are controlling the country, remove the monkeys!' They were giving us a lot of apples, a fruit many of my soldiers had never seen, and grapes and milk, all for free." 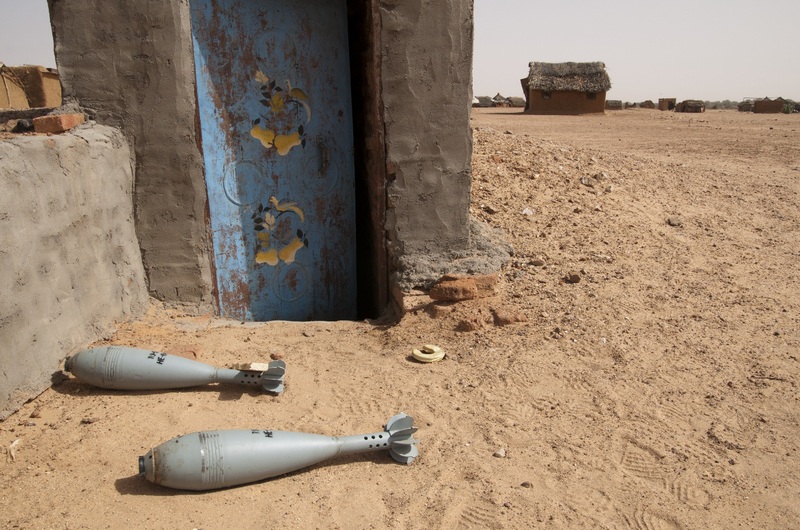 Among the JEM’s troops were many child soldiers, hastily recruited from refugee camps in Chad, and dreaming of adventure or of taking revenge for murdered family members. His eyes shining through tinted glasses, there is something messianic about Dr. Khalil as he declares: "Everybody was ready to die in Khartoum. We don't want just to fight in the desert, in remote areas: we want to fight the government in Khartoum, all my soldiers want to go to Khartoum. We were expecting to take power, not to go back to Darfur. At least we delivered a message to the people of Khartoum, that they can't stay without war. They never heard the sound of a bullet. But if there is no peace in Darfur, then there should be no peace in Khartoum. Nobody expected we could move to Khartoum and fight inside the city. We became more popular than ever. Before, there were not many Arabs in the movement; now, every day, they're coming. 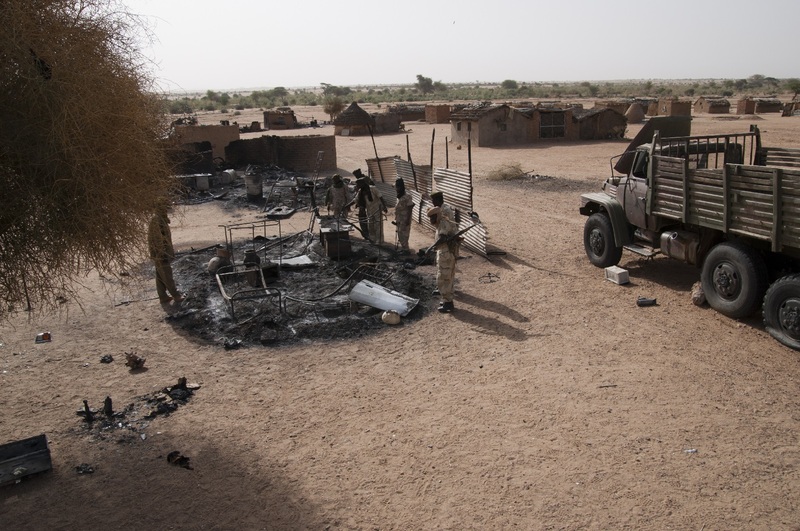 The war in 2009 is not like that of 2003; the Janjaweed have started to have heavy losses. They were the right hand of Omar Bashir, and now this hand is broken . . . They will not support Bashir anymore, it has been very expensive for them. Now supporting Bashir means . . . "
Suddenly Dr. Khalil is interrupted by violent explosions, close by. "Da shunu? What is that?" he cries to his men, who are starting to run off in all directions. "Hey! Position the anti-aircraft gun and the Dushka machine guns!" To me again: "This is a MiG. When an Antonov comes, you hear its voice before it arrives. With a MiG, you hear the bullets first." He takes a drink from his Pepsi. "They want you?" I ask smiling. "Yeah, exactly!" he replies proudly with another smile. "This is why we have to change positions. They have some spies; if they catch you, they will sell you to the government." No one was hurt. But all around our tree, Dr. Khalil's men are preparing to leave before the airplanes return. The chief pays no heed: he wants us to resume our conversation. At certain moments, I have the impression that he is no longer addressing me, but the man who has just, yet again, attempted to kill him: Omar al-Bashir. "One day Omar al-Bashir will search for a way to the International Criminal Court, because there is no decapitation in the court. Here, if my guys find Bashir, there is no chance for him." As Dr. Khalil talks, the guys in question seem to be growing impatient. Dr. Khalil rises. The rug that we have been sitting on is rolled up and loaded onto a pickup truck. The rebel chief gets into the passenger seat. Other cars join him, and they set off in a distended column toward the interior of Darfur, leaving a cloud of dust in their wake. For me, it is time to head in the opposite direction, toward the Chadian border. As I say my goodbyes to the men with whom I have just spent four days, Mahamat Bahareddin tells me, "Now I'm new in the JEM and I could not offer you a proper welcome, but when you come back, I will have my own car." The JEM's next stop is Mahamat Bahareddin's hometown, Am Boru. That morning, Mahamat Bahareddin was explaining to his comrades, using drawings in the sand, how to go about 'liberating' Am Boru. Tomorrow, the BBC will announce: Raiders seize Sudanese Army base. In reality, the fighting at Am Boru was harder than in Kornoy, and the rebels were obliged to withdraw at dusk, after three hours of battle, with heavy losses: more than eighty dead and two hundred wounded. A month later, back in France, I receive an email from a friend who works for an NGO in Bahay. "Mahamat Bahareddin was killed in the attack on Am Boru. Government forces destroyed Ali Wafi's car, and Mahamat Bahareddin was shot multiple times. I am sorry to break this sad news to you. Mahamat Bahareddin was a very nice and good-hearted man. At least he was able to die at home, in Am Boru." In December 2011, Dr. Khalil was killed during a bombing raid much like the one described above. It took place far from Darfur, in Kordofan, where the rebel Sudan People's Liberation Army had just restarted its thirty-year struggle against Khartoum. 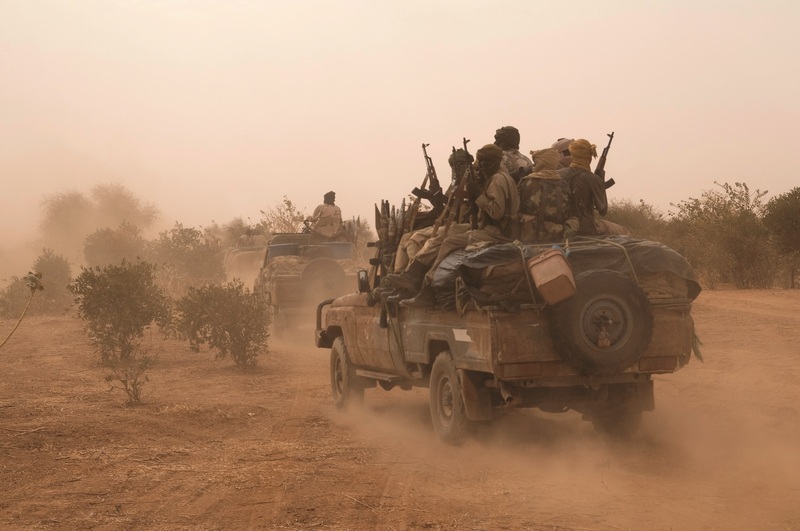 The JEM survived its leader's death and managed to ally with the Kordofan insurgents and pursue its strategy of bringing the war closer to Khartoum. 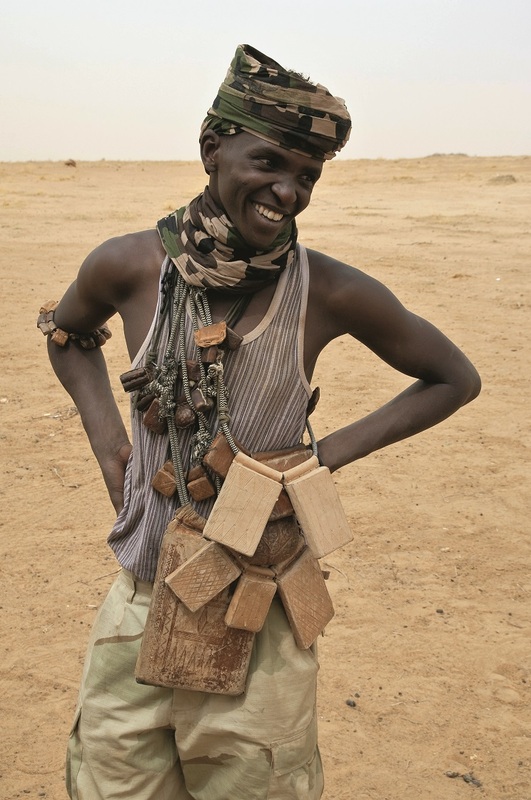 A young rebel from Kordofan, bedecked in charms. Jérôme Tubiana is a writer and photographer, who has covered conflict in Chad, Sudan, and the Horn of Africa for over twenty years. As a journalist, he has worked for National Geographic Magazine-France, Géo, Le Monde Diplomatique, XXI, Le Point, and Libération. His work has also been published in the London Review of Books, Foreign Policy, Foreign Affairs, and Dispatches. He has worked as a researcher and photographer for organizations including the United Nations and the International Crisis Group, for which he is currently the Sudan Senior Analyst. He is the son of French ethnographers Joseph and Marie-José Tubiana, who studied Ethiopia, Darfur, and Chad. This chapter pays tribute to his late father. It was published in French as part of a longer book, Chroniques du Darfour (Glénat, 2010), whose English version is in need of a publisher. Colin Robertson has worked for a number of development and humanitarian NGOs, with a particular focus on Sudan and Central Africa. He is currently based in Lubumbashi, Democratic Republic of Congo. Paul Reeve is an independent French-English translator and editor. He has lived in Montreal, Cape Town, Berlin, London, Toronto, Victoria (Canada), Lisbon, and Paris, where he is more or less based. He holds degrees in the cognitive and brain sciences from universities in Montreal and Paris.